Capital One® Spark® Miles Select for Business is a business credit card with no annual fee and a straightforward travel rewards program that accrues miles on every purchase. Miles can then be redeemed for virtually any type of travel purchase, including airfare, hotel stays, and car rentals. Unlike many brand-specific business travel cards, such as Gold Delta SkyMiles Business, Spark Miles Select assigns a fixed value to miles redeemed for travel expenses: $0.01 per mile. Spark Miles Select is comparable to numerous other business travel cards, including stablemate Capital One Spark Miles, CitiBusiness / AAdvantage Platinum Select, and American Express Business Platinum. It’s worth noting that many competing cards carry annual fees ranging from less than $100 to more than $500. Capital One Spark Miles Select is also very similar to Capital One Spark Cash Select. Since miles always have a fixed value of $0.01 apiece on travel expenses, this card effectively earns a 1.5% cash back rate when you redeem for travel. The principal difference is that miles are typically redeemed for travel, whereas the Spark Cash Select’s cash back earnings are redeemed for cash. When you spend at least $3,000 within 3 months of opening your account, you get 20,000 bonus miles. That’s worth $200 at redemption. All purchases earn an unlimited 1.5 miles per $1 spent with no caps or restrictions. Since miles are worth $0.01 apiece at redemption, this equates to a 1.5% cash back rate on all purchases. You can redeem accumulated miles for travel in one of two ways. First, you can use Capital One’s Purchase Eraser tool (available online and by calling Capital One’s customer service hotline) to offset travel purchases you’ve already made. Purchase Eraser basically functions as a statement credit and can be used for up to 90 days from the purchase date. If you don’t have enough miles to offset an entire purchase, you can use whatever miles you do have, subject to a 2,500-mile minimum. Second, you can use your miles to book airfare, hotels, car rentals, and other travel purchases directly through Capital One’s travel portal. If you redeem in this manner, there’s no set redemption minimum to worry about. Neither redemption method comes with blackout dates or seat restrictions. You can also redeem miles for non-travel items, including cash, gift cards, merchandise, and general statement credits. However, values for non-travel redemptions vary widely and are subject to change. This card has a 0% APR on purchases for 9 months. There is no annual fee, foreign transaction fee, balance transfer fee, or fee for additional employee cards. The late payment fee is $39, and the cash advance fee is the greater of $10 or 3%. At the end of every quarter, and again at the end of the year, you receive a categorized, itemized summary of your spending during the period. This includes detailed reports on employee card spending, if applicable. You can easily download purchase records in formats compatible with Quicken, Excel, and QuickBooks, simplifying business accounting and tax preparation. Capital One Spark Miles Select for Business comes with some other noteworthy benefits, including 24/7 emergency travel assistance (with lost card replacement), complimentary collision and theft protection on car rentals paid for in full with the card, and fraud detection. This card requires good to excellent credit. A minor ding or two probably won’t disqualify your application, but more serious credit issues certainly will. No Annual Fee. Capital One Spark Miles Select doesn’t have an annual fee, which is great for budget-conscious business owners who don’t intend to use the card enough to offset an annual levy. Many competing cards, including CitiBusiness / AAdvantage Platinum Select ($95) and Marriott Bonvoy Business™ American Express® Card ($125), do come with annual fees. No Foreign Transaction Fees. This card doesn’t charge foreign transaction fees. That’s great news for cardholders who do business overseas, and a nice advantage over competing cards that charge foreign transaction fees of 2% to 3%. Flexible Travel Rewards Redemption. You can redeem Capital One miles for basically any travel purchase, either at the moment of purchase or retroactively via statement credits. Depending on how you redeem, there’s also no minimum redemption threshold. This is a disadvantage relative to brand-specific business travel cards, such as Gold Delta SkyMiles ($95 annual fee, waived in the first year) and CitiBusiness / AAdvantage Platinum Select, which restrict redemption to specific travel types and brands (airfare and airlines). Solid Early Spend Bonus. This card comes with a solid early spend bonus: 20,000 miles ($200 value) when you spend $3,000 or more within 3 months of account opening. Some competitor cards, notably Capital One’s own Spark Classic and U.S. Bank Business Edge Cash Rewards, don’t offer early spend bonuses at all. No Blackout Dates or Seat Restrictions. Spark Miles Select never imposes blackout dates or seat restrictions on award travel. This dramatically simplifies the redemption process and eliminates the frustration of being unable to redeem miles on a particular date or in a particular class. Many branded business travel rewards cards do have blackout dates and seat restrictions, especially during busy travel times. No Rotating or Tiered Spending Categories. This card’s travel rewards scheme is super-straightforward: Every $1 spent earns 1.5 miles, with no exceptions – a flat 1.5% rate of return on your credit card spending. That’s a welcome change from business travel rewards cards with more complicated mileage schemes, such as the CitiBusiness / AAdvantage Platinum Select and American Express Business Gold ($295 annual fee). Earning Rate Is Capped at 1.5%. Capital One Spark Miles Select always earns 1.5 miles per $1 spent – which, since miles are always worth $0.01 apiece, translates to a 1.5% cash back rate. Though this is a nice baseline earning rate, it’s a far cry from some competing cards’ high-end rates: American Express Business Gold earns 4 points for every $1 spent in your 2 top-spending categories each year (up to the first $150,000 in annual spending), while Marriott Bonvoy Business™ American Express® Card earns 6 points for every $1 spent on hotel stays. In the case of Marriott Bonvoy Business and many other brand-specific business cards, miles and points are often worth well over $0.01 apiece – higher than $0.02 apiece, at times – depending on the specific routes or hotel properties for which they’re redeemed. This is a further disadvantage for Spark Miles Select, which – due to Capital One miles’ fixed value – prevents cardholders from getting more value out of already-accumulated miles or points. Travel Redemptions Offer the Best Value. Though you can redeem your accumulated miles for cash back, merchandise, and other non-travel items, doing so severely crimps the value of your miles – often cutting them in half. If you prefer a business rewards card that lets you redeem for a wider variety of items without cutting into the value of your miles or points, look to American Express’s business cards. And, if you always want to earn $0.01 per point for cash back redemptions, look no further than the Capital One Spark Cash Select. No Membership Status Tiers. Spark Miles Select doesn’t confer membership in frequent flyer or travel loyalty programs, which, along with other benefits, typically come with such cards. American Express Gold Delta SkyMiles Business automatically enrolls you in Delta’s loyalty program, giving you an opportunity to attain higher status tiers and progressively more generous rewards, such as complimentary class upgrades. Limited Travel Benefits. This card has few fringe benefits or creature comforts that regular travelers long for, such as priority boarding or airport lounge access. 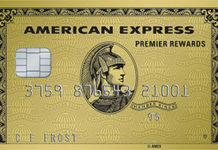 If you’re looking for a card that helps you travel in style, rather than just travel for less, look to a higher-end card such as the American Express Business Platinum Card ($595 annual fee) or the more reasonably priced Business Gold Card ($295 annual fee). Capital One® Spark® Miles Select for Business doesn’t have the highest mile-earning rate or juiciest fringe benefit package. Beyond the rewards program, it’s actually a pretty bare-bones card. However, if you’re not overly loyal to a particular hotel or airline brand, it’s hard to go wrong here. Even if you also have a branded rewards card in your wallet, you’re likely to be grateful for your Spark Miles Select card when it comes time to book your next holiday or peak-season flight. 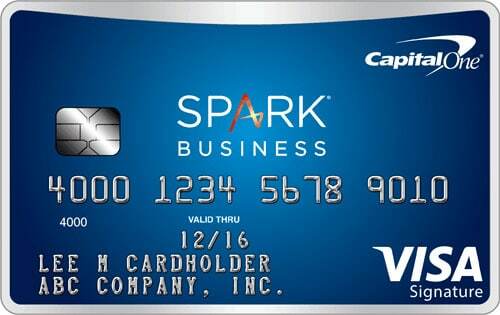 Capital One® Spark® Miles Select for Business is ideal for budget-conscious, moderate-spending business owners who don’t want to deal with confusing travel loyalty programs – which often have blackout dates and other restrictions – and aren’t enamored with any particular hotel or airline brand. It’s also very useful for business owners who need to transfer high-interest balances without paying through the nose. It’s not great for people seeking more generous rewards programs, nor those who value luxury perks and priority service while traveling. This card’s minimal fees, simple rewards, solid early spend bonus, and lack of blackout dates and seat restrictions are all good benefits. Its relatively low maximum earning rate, the difficulty it poses in getting good value on non-travel redemptions, and its limited travel benefits are drawbacks. Also, it’s worth noting that this card has the same effective rate of return as Spark Cash Select for Business, but basically forces you to redeem for travel – in other words, it’s a cash back card masquerading as a travel card. Still, it’s a fine card for travelers who aren’t brand loyal.